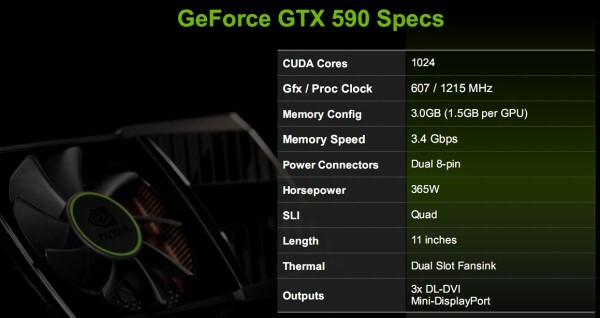 Nvidia Geforce GTX 590 Launched and Reviewed. 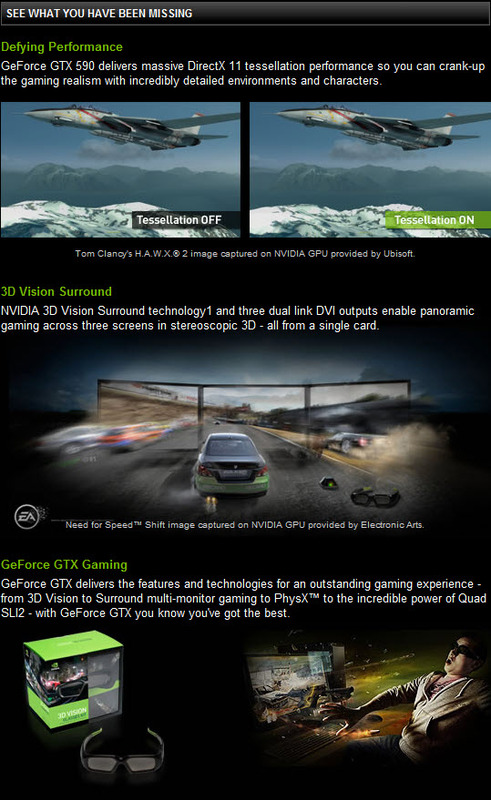 We’ve come along way from multiple leaks and announcements and finally today on March 24th the wait is over, Nvidia has officially launched their Top Dual Chip Flagship GPU named the Geforce GTX 590 and on the release day it has already been reviewed by different sites. The card is currently Nvidia’s Fastest DX11 capable card which features outstanding performance in every gaming app to give you the true edge. 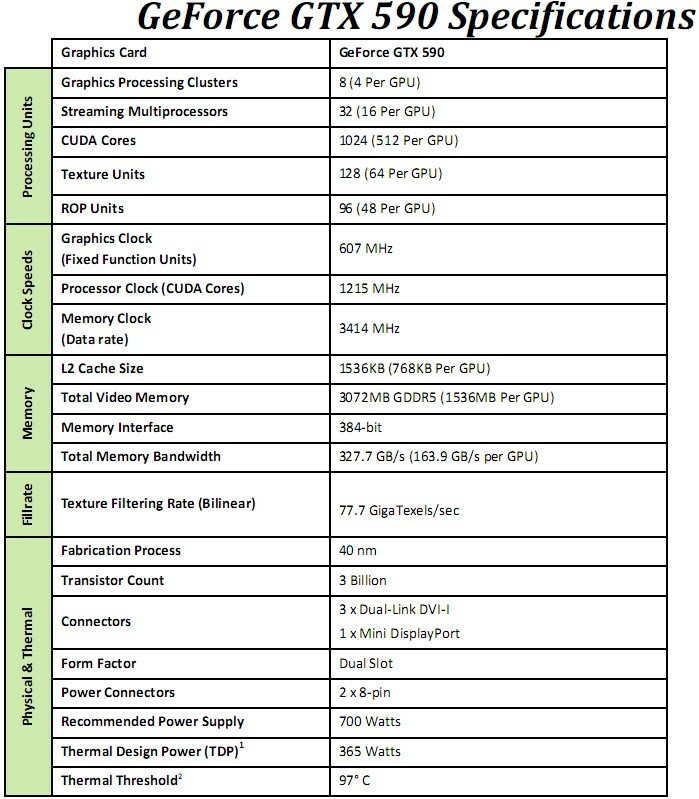 So let’s take a look at the final official specs of the card, It’s a Dual GF-110 (GTX 580 x 2) based cards packing a total of 1024 Cuda cores( 512 from each core) and runs at 607/1215/3414 mhz of Core/Shader/Memory clocks respectively. The 3GB GDDR5 memory runs across a 384bit x 2 wide memory interface providing a total of 327.7Gb/s memory bandwidth. The card also features 128 Texture Units and 96 ROP’s. The Dual GF-110’s are built on a 40Nm process and are a refined version which allow better performance while giving out less heat and lower power requirements. The total Transistor count of the card is an astonishing 3 billion. The overclockability of the card is pretty much limited but the gains after overclocking above 700mhz are 20-25%, Voltage increase may be required for higher overclocks though the negative side of the voltage increase has been revealed which you can see here. The card requires a total of 365w of power through dual 8 pin connectors to juice it up and the thermal treshold is maintained at 97C, The card runs at 85-65C under full load, A bit high however shows that Nvidia did everything they could to make it less noiser but cooler. a 650-700W PSU should be enough to run it. The noise is also maintained at 48 Dba against the 53 Dba of HD6990 at load. 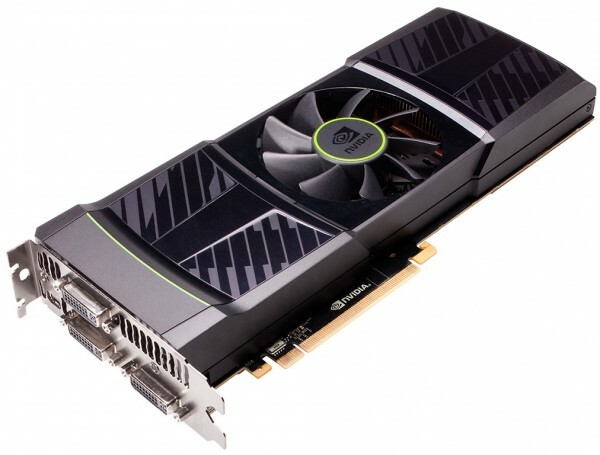 Coming to the cooler, The card uses a similar design to the GTX 295 ( Nvidia’s Previous Dual chip card) with a large fan placed in the middle and also uses dual Vapor Chambers which utilize thermal fins through which the air can pass through and cool them down, The hot air is passed through the many vents placed on the sides and exhaust of the GPU. Another interesting thing is the glowing Nvidia Logo which not only adds a good touch to the card but has its own function, It blinks if the card doesn’t get sufficient power and is a really nice effort by Nvidia to put it up there. 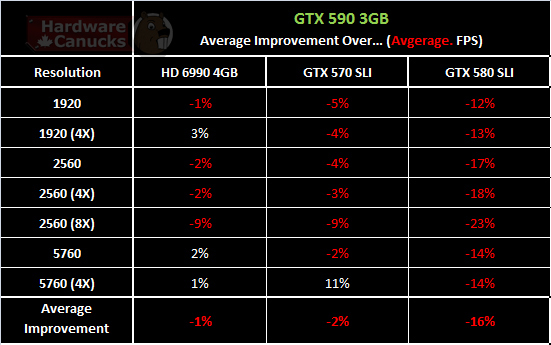 We can pretty much say that the card has a clear lead over AMD on upto a res of 2560×1600, After that things start to get ugly for Nvidia and that is where the Extra gig of Vram on the HD6990 truly shines, Also we noted that even the HD5970 is capable to outperform the card in some titles. The main reason for this could be the lower clocked GF-110 cores and as i previously stated that a mere 700mhz OC was able to dish out a 20% gain in performance which totally annihilates the HD6990. The card comes with 3 DVI and a single HDMi connector for running upto 4 monitors in split screen. Last of all the card retails for $699 which is the same as HD6990 however Oc’ed variants from EVGA are priced at 729$ and Hydro Copper Water cooled variant goes for 879$. It’s better to invest in a Water cooled version if your aim is to benchmark the card as the extra cooling would give you a slight bit of headroom as compared to the air cooled one. 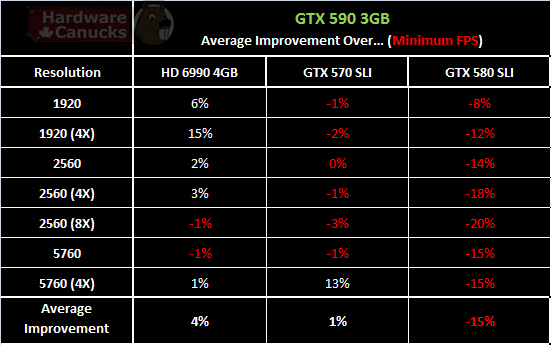 I would say that Nvidia with its Exclusive features such as PhysX, Cuda and 3D vision would be a great card for the price same as the HD6990.